An illustrated fantasy novel written by two best friends in their early 20's. 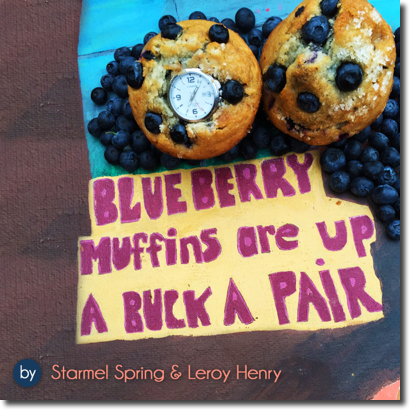 Blueberry Muffins Are Up A Buck A Pair is a heart-warming, fantasy novel written by two best friends in their early 20's back in the 1970's but not released until the recent passing of one of the authors - a wonderful tribute. Chock full of fun, imagination, creativity, friendship, levity, and adventure - very visual! A book for all ages, set in 1959, but in a parallel universe, starring Albert, an eternally youthful 77 year old and his 7 year old best friend Wilber. Join them on their many surreal adventures as Albert seeks to cling onto his youth and find the answer of a lifetime. Three wild days in Albert's world full of imaginative scenery and quirky characters, combined with plenty of good old fashioned 1950's boyhood charm, will leave you wondering what could possibly happen next. Spotify Bonus! Includes a specially curated Soundtrack for each chapter on Spotify to get you in the proper mood.